This story was written by Ronald W. Davis. Credit to Tariq Shakoor for editing this article. Read more about Ron at Interview with Ron Davis, former Speed City Spartan. The prospect of making history never dawned on me when I journeyed to Africa in the summer of 1974. I was just excited to be doing what many African-Americans always dreamed of doing–returning to the Motherland. I was excited about the possibilities and opportunities that lay ahead, but never thought that those opportunities would be history making. As I think back on it, it was pretty heady stuff for a skinny little kid from Bridgeport, Connecticut who used his legs to run into history. I had to keep saying it over and over again in my head in order for me to accept the reality — Ron Davis, National Athletics Coach of Tanzania. Me, Ron Davis the National Athletics Coach of Tanzania! Maybe I was dreaming! But not only was it real, it was only the beginning of a magnificent relationship and journey with the great distance runner, Filbert Bayi, who was already on the way to becoming a national treasure in Tanzania. What a journey it was! The bonding and coaching experience with Filbert Bayi was not only personally gratifying, it was historical in a way I could never have imagined. Filbert Bayi would go on to win the country’s very first Olympic Silver medal in the 1980 Games. And in just a few days later his countryman, Sulimen Nyambui, the second Olympic medal for Tanzania in the 5000 meter run. It was the first time ever for Tanzania to win any kind of medal in the Olympic Games and the country has not won an Olympic medal since that historic event in 1980. And the dream come true did not end here. Afro Sports, Africa’s number one sports magazine, voted Filbert and Sulimen Africa’s Athletes of the Year, and I was voted Africa’s Coach of the Year! It was the first time for an African-American or any other American to receive such an honor in sports in the entire continent of Africa. So yes, this was pretty heady stuff. But how did this all come about? Prior to my arrival to Tanzania in May of 1979, I was the National Athletics Coach in Nigeria for six and a half years. During my coaching tenure, I was joined by other prominent African-American athletes who were also employed by the Nigerian National Sports Commission. Among them were Lee Evans, Leon Coleman and Otis Burrell. Having other Americans there made my transition easier and helped with my confidence and comfort level. We bonded easily and helped each other with approaches to training from our respective areas of expertise. Lee Evans, world record holder and gold medal winner in the 400, was especially helpful with his knowledge in the sprints. The Director of Sports for the Nigerian National Sports Commission was Mr. Issac Akioye who in my estimation was the best National Sports Director in Africa at that time. We were fortunate to be under his supervision. 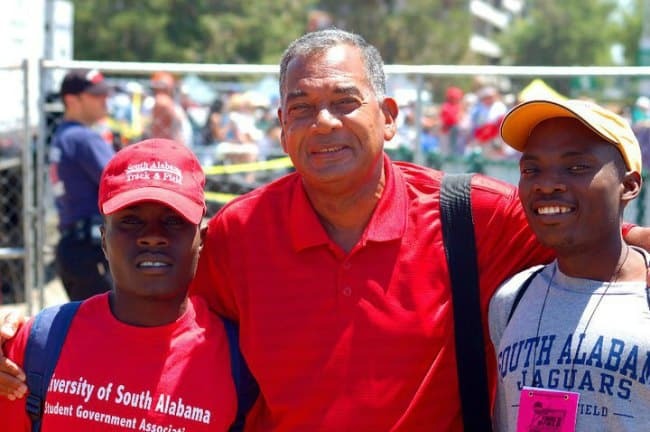 Mr. Akioye was a true visionary who exhibited a special affinity to African-Americans in track and field both as athletes and coaches. He was impressed by their resilience and determination to be successful even while living under the oppressive racial conditions in America. It was this view of the African-American athlete that fueled his determination and desire to bring us to Nigeria as coaches. He was confident that our skills and experience as well as our character would be instrumental in developing world class athletes in Nigeria. Besides Mr. Akioye we also had a Director of Coaching, Mr. George Dibia. Mr. Dibia was not only responsible for supervising the coaches, he was also the point man for making sure we had everything we needed to be successful. 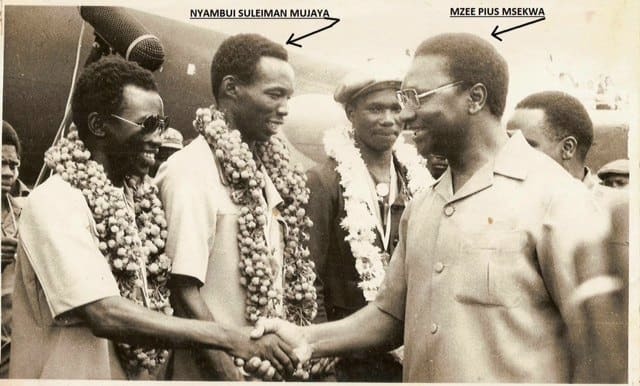 Under the guidance and support of these two men, we were able to develop the National Program that became the first African country to defeat Kenya at the 1978 All Africa Games in Algeria. Our team dominated the All African games in the medal count as we went on to score a historic 69-63 victory over Kenya. The word throughout the games was that the Green and White (Nigeria’s national colors) was everywhere on the track. We were the talk of the meet and everyone took notice. And with that historic win, my name began to circulate around the track world in Africa which may have helped to lay the groundwork for me eventually becoming the track coach for Tanzania. How it actually came about is an example of different forces working together to place me in the right place at the right time. In 1978 the Commonwealth Games were to be held in Edmonton, Alberta. Nigeria decided not to attend the Games and returned to Nigeria after the All Africa Games. The reason for the boycott was pretty straightforward. Nigeria decided to boycott the Games in protest for New Zealand’s participation in sporting events in Apartheid South Africa. This was not a new effort for Nigeria as they organized and led the boycotts of the 1972 Olympic Games in Munich, the 1976 Olympic Games in Montreal, and now the 1978 Commonwealth Games. 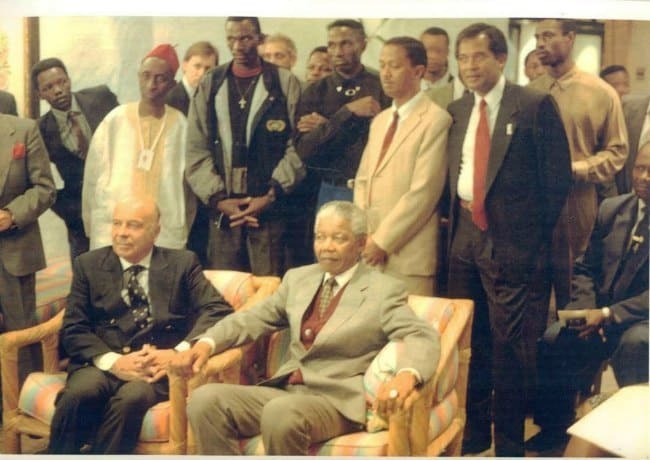 If nothing else, they were consistent in their support of the anti-Apartheid movement that was spreading all over the world. Canada sent an Air Canada airplane to Algeria to transport all the African teams who decided to participate in the Commonwealth Games. Lee Evans, John Carlos and I did not travel with the teams on the Canadian plane, but instead were on a flight to Germany at the invitation of Puma. John was representing Puma at the Commonwealth Games and we simply benefitted from his relationship with them. After enjoying a few days in Herzogenaurach, Germany John and I headed for the Commonwealth Games in Edmonton while Lee went on vacation in California. During our flight to Canada I recall looking out the window of the airplane and thinking back to my high school days running on Harding High’s old cinder track. I smiled to myself as I thought about those days running cross country in Beardsley Park, attacking those hills, and running the hills on Boston Avenue. Thinking back to those days I never would have imagined that I would be where I was that day on my way to the Commonwealth Games as one of the coaches of the Nigerian national team. Me — Ronnie Davis in flight to Canada with the great John Carlos as a traveling mate and colleague. Sometimes it still did not seem real to me, yet it was! It was a long hard road and I was still on that road wondering what the next bend in the road would offer. I would soon find out. I smiled a smile of satisfaction while I waited to see what my future would hold. I always liked Canada so I was anxious to get back there and enjoy the people and the culture and just relax a little before returning to my regular routine. But here is where fate or destiny or whatever you want to call it entered into my life like a gentle breeze. One day while doing some running, yoga, and stretching at the University of Alberta’s track, I ran into Filbert Bayi and his coach. Filbert just happened to be training there at the same time. Little did I know at the time how that chance meeting would be the next “bend in the road” for my journey. While engaging in some small talk and watching Filbert doing his training runs, I mentioned to Mr. Sulus, his track coach that I would be interested in coaching in Tanzania someday. Quite unexpectedly, Mr. Sulus mentioned that the Tanzanian Minister of Culture and Sports was in Edmonton and that he would arrange for us to meet. I was stunned at his response and began to wonder if I had put myself in an awkward position since I was already the coach of the Nigerian team. But, the idea of talking with the Minister of Culture and Sports had my head spinning with possibilities. Mr. Sulus telephoned me a few days later to say the Minister of Culture and Sports; the Honorable Chadiel Mgonja, would like to meet with me. From that point on things moved at break neck speed as I came closer and closer to that bend in the road. Just prior to my scheduled meeting with Minister Mgonja I was cornered by a journalist from Canada’s National Newspaper, and agreed to an interview. The interview caught me off guard, but I consented and it nearly blew up in my face. The journalist was interested in my perspective on Nigeria’s absence from the Games there in Edmonton. One of the things I said was that I was sorry that Nigerian officials decided not to participate in the Games, however that was a huge mistake on my part. That paper was widely read by Canadians and I took some heat for that ill-advised statement. I failed to place my statement in proper political context by mentioning that Nigeria had always been at the forefront of the anti-apartheid movement and their absence was consistent with their long-term leadership in this noble effort. On my way to the interview with Tanzania’s Minister of Culture and Sports, I was met in the hotel lobby by Honorable Abraham Ordia, the Secretary General of Nigerian National Olympic Committee and President of the Supreme Council of Sports in Africa. He was not pleased with some of my statements in the interview and let me know in no uncertain terms but not in a harsh manner. He asked me not to consent to any more interviews while in Canada and of course I agreed. I apologized as sincerely as I could and truly felt bad about the whole incident. My meeting with Minister Mgonja was very positive even though I was nervous and hoping that I would not say anything to disqualify myself. But I was so comfortable with Mr. Mgonja that I knew right away that if he hired me this would become an unbreakable bond. He was so gracious and positive and I could not help but think that my success with the Nigerian team was a major door opener for me. The Minister indicated that he was interested in hiring me as the National Athletics Coach and to prepare the national team for the 1980 Olympic Games. I tried to remain poised and cool with this amazing news at least outwardly. But I was overwhelmed with joy on the inside and my mind was racing. There was a member of the Tanzanian Embassy staff attending the meeting as well. The Minister said he would be in touch with their Embassy contact about his decision and would be in contact with me about all the details surrounding his decision. So I provided my contact information to the Tanzanian diplomat and left the meeting on an indescribable high. The bend of the road was now in sight! I felt like I was walking on air and I’m sure people passing me on the streets could see my happiness on display as I had a smile on my face that just would not leave. Now, I just had to wait to get the details of the offer and tie things together. I had come to Edmonton primarily to see my daughter and her mother and to just relax a little before returning to my routine in Nigeria. But circumstances quickly came into play and now with the possibility of a position as coach of the Tanzanian National Team pending, I was really very excited. The only day I watched the Commonwealth Games was the day I knew Filbert Bayi was going to run the finals of the 1500 meters event. John Carlos and some other friends attended the meet with me. I was interested in seeing how Filbert would approach this event and if I could learn anything about his running style that might help me if and when I became the coach of the Tanzania Team. Bayi went out strong as he usually does but in the last 100 meters a British runner named Dave Morcroft overtook him to win the gold with Bayi taking the silver. I was disappointed to see him lose his race, a race I fully expected him to win. But my feelings about the race and my disappointment were soon washed away with the news that would follow. After Bayi’s race an announcement came over the PA system for John Carlos to come to the security station in the stadium. We had no idea what this was all about, but we anxiously rushed to the security station. When we arrived an official informed John that his wife had died! We were frozen in disbelief. It had to be a bad dream, just couldn’t be true but unfortunately it was true and devastating to all of us. Still in disbelief and shock, we took John to the home of my Lebanese friend, Ahmad where we were being accommodated at the time to pack and make arrangements for his flight home. I don’t even remember the drive to Edmonton International Airport. John had a blank look on his face as he went into a world of his own battling the unexpected turn of events and tragedy that seemed to come out of nowhere. Words were inadequate as we watched John depart as we returned to my friend Ahmad’s home. The Bayi race seemed so unimportant now as we faced the reality of such a monumental personal tragedy. I think we all felt John’s pain and anguish. It took me awhile to get my equilibrium back. I stayed in Edmonton after the games and then traveled to California and then to Toronto. While in Toronto visiting with my daughter and her mother, I received the call from the Tanzanian Embassy I had been anxiously awaiting. I had been selected to become the new coach of the National Tanzanian Track team! When I returned to Nigeria, I met with the Ambassador from Tanzania who would be responsible for making my travel arrangements to Tanzania. We had a very open and frank discussion about my present obligation to the Nigerian team and that my availability would be contingent upon being able to void my contract with them in the proper manner and without causing problems. After working through some details with Nigerian officials, I was able to fully accept my new position with a renewed sense of excitement. My journey was now on track for a new challenge and new opportunities although I couldn’t help but be a bit overwhelmed. But I was ready to take on the challenge of working with one of the premier runners in the world. When I arrived in Tanzania, I was surprised at the mass of journalists and media at the airport to meet me. I didn’t experience anything like this before and it was pretty heady stuff. It was hard to believe that the hiring of a coach could create such enthusiasm and excitement. But what I didn’t quite realize at the time was how strongly the country as a whole identified with the national sports teams. They followed their accomplishments very closely and experienced the collective joy of victory and agony of defeat. It was a testimony of their national support and pride. On top of that there was the fact that I was the first African-American to be hired as a National Athletics Coach in Tanzania. Couple that with the fact that we would be preparing for the Olympics! Excitement and expectations were high to say the least. With so much on the line, I was hoping that I could live up to the challenges and expectations, and decided the best approach for me was to simply focus on the task at hand and rely on my experience and past coaching I had personally received. From the very first day of reporting to my new position, I had a wonderful relationship and outstanding support from Honorable Chadiel Mgonja, Minister of Culture and Sports, and all of the Tanzanian officials connected to the National Athletics team. I had the full support of Mr. Zambi, who was secretary of the Tanzania National Olympic Committee and had previously coached Filbert Bayi, who was regarded as a national treasure and hero. Perhaps my greatest supporter and the person I came to rely on most during my transition and tenure was Professor Sangui, the head medical doctor for the National Teams. He was a consistent source of information and insight and made my transition very smooth as he exhibited a genuine belief in me personally and my ability to be successful. When you have someone like that who believes in you and supports you in every way, it reduces any anxiety you may normally have in a new and challenging environment. Soon after my arrival, I was informed that we would be going to Arusha, Tanzania to prepare the National Athletics Team for the upcoming African Championships to be held in Dakar, Senegal. Arusha would also be our home base for training for other major international competitions as well as for the 1980 Olympic Games. I stayed in Dar es Salaam, Tanzania for about a week, and then I was informed that Filbert Bayi wanted to meet with me. I was delighted to have an opportunity to meet with Filbert one on one and get a feel for how we would work together. So we agreed to meet in a local restaurant over tea and sweet biscuits. It turned out that Filbert wanted to inform me that he had not trained since the 1978 Commonwealth Games because of an injury. He also shared that he had no idea when he could resume training and was on his way to Germany for medical treatment. However, he assured me that he would be okay and ready for training for the Olympic Games. After our meeting the reality of my situation settled in once again and I wondered to myself how things would work out. Here I was entrusted with the preparation and training of a world class runner and record holder and now learn that he was presently trying to overcome an injury. How would this injury impact his preparation and training? Would he recover and perform at the level prior to the injury? What adjustments would I have to make once he was ready to come back? Was he going to be coachable and trust me with his preparation and training? All these questions swirled around my head as I contemplated our future working together. However, in the end all things came together as we moved closer to the 1980 Olympics. Once Filbert recovered from his injury and started back training, a great relationship evolved. From the very first day of training until I departed Tanzania, we never had any disagreement or tension in our relationship. Filbert was the ideal athlete and it was a joy working with him. He accepted my advice and training methods without even a hint of resistance. My anxieties about training a world class runner faded quickly in large part because of Filbert’s attitude and willingness to work hard and to listen. In reality I didn’t have to do a lot or to make any major adjustments to Filbert’s running style or approach to running. He was a gifted athlete whose only desire was to excel. I tried to incorporate all that I had learned from my previous coaches and others who had success in training distance runners. Incorporating strength training when we could along with speed and sprint techniques I learned from the great Bud Winter were the foundation of my philosophy for coaching. I approached our training like you would train for a marathon with hill training and distance for speed and endurance. The good thing about this approach was that the athletes, including Bayi, were already acclimated to hill training so this was very easy to implement. One thing I came to appreciate in working with both the Nigerian and Tanzanian athletes was their focus, discipline and determination. That was instinctively a part of their culture that helped them become successful as athletes. There was no need for head games or mental training as it was already cultivated in their upbringing, something often missing in American athletes. Another thing about the African athletes is that they were always on time for practice, they had a strong work ethic, and were passionate about running and training. It just made my whole job a lot easier. Leading up to the Olympic Games in Moscow, Filbert posted some of his best performances ever which were so critical in his preparation for the Games. I felt that the endurance and hill training, speed endurance training, speed workouts, strength training, and sprint techniques were kicking in and helping Filbert with his preparation before the Games. If we just examine some of the highlights of his best performances heading into the Olympics, we can see he was ready for Moscow. For instance, in London, Filbert ran a two mile race placing second to Dave Moorecroft with a time of 8:19:45, a personal best for that distance. In Norway at the Major Bislets Games we competed twice and both races were exceptional. In the first event, Bayi ran the 3000 meter race and finished with his personal best of 7:39:27. 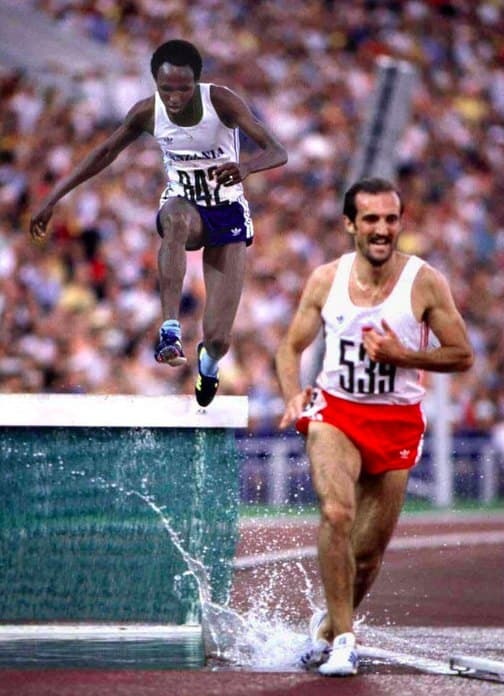 A few weeks later in another Bislets Games, Bayi ran the 5000 meter race in the fastest time recorded that year in 13:18:20, another personal best for him. Then in Stockholm, Sweden, Filbert wanted to run the 3000 meter Steeplechase event, and once again he turned in the fastest time in the world achieving his personal best time. After the event Filbert and I agreed to enter him into the 3000 meter Steeplechase event in the Moscow Olympic Games. I then sent a telex to the Tanzania National Olympic Committee to enter Filbert into the 3000 meter Steeplechase event. After the win in the steeplechase, on that same Saturday evening my good friend and brother, Edwin Moses, suggested we work on Filbert’s technique for the hurdles, and we agreed to meet the very next day, Sunday morning at 9:00. What an honor it was for us to have the best hurdler in the world agreeing to help us with this very demanding event. Edwin and I had become close friends during our time in London. After our hurdle session when we walked back to the hotel a huge crowd gathered when word got out that Edwin Moses was on the scene. Edwin was very popular and beloved throughout Europe. You couldn’t ask for a better ambassador for the sport or for America. The crowd followed us all the way back to our hotel. It was an amazing display of respect that I have never witnessed before anywhere. At the next meet in Gothenburg, Sweden Bayi had the crowd on its feet as he was on a blitzing world record pace in the first 1200 meters of the 1500 meter race that he eventually won in 3:35 one of the top times turned in that year. Bayi won the Most Outstanding Athlete of the meet award and was presented with a huge trophy. It would be our final competition before heading to Moscow for the Olympics. Once we arrived in Moscow it seemed like the excitement we anticipated grew with each day. My head was spinning as I tried to maintain my focus. Bayi and I were very popular with the journalists. Because of Bayi’s world class status and the high expectations for a quality Olympic performance, and my being Bayi’s coach, Tanzania’s National coach and the only American coach in the village there was a lot of attention. The media was eager to know about Bayi being entered in both the 1500 meter and the 3000 meter steeplechase. This would be the first time anyone doubled in these two events resulting in excitement being escalated. Tanzanian officials placed Filbert, Sulimen Nyambui, and I in a large three-bedroom suite away from other people and athletes. Their thinking was that they didn’t want us to be disturbed or overwhelmed while waiting to compete. It probably was the right move judging by the excitement Filbert had caused on our arrival. The world was watching and the entire country of Tanzania was watching hoping and praying and holding its collective breath as the Olympics got underway. As Filbert moved easily through the qualifying heats, he became increasingly more withdrawn and very quiet. He rarely spoke a word as we went through our final workout runs and preparation for the finals. After a while I became concerned that something was wrong. His nearly complete shutdown was unnerving to me since I had no idea what he was thinking or what caused the shutdown. He did not utter a word to me until the morning of the finals. As we entered the stadium, he put his arms around me and told me not to worry that everything was going to be okay! I was so relieved to hear this from him and I felt much better and more relaxed than I had been in days. I later found out that at times Bayi would often shut out everything and everyone prior to a big race to focus and draw on his inner strength for the upcoming event. As we entered the stadium I had a momentary feeling of being out of body. Was this all really happening to me? My mind momentarily flashed back to the cinder track at Harding High School in Bridgeport, Connecticut, then to my years at San Jose State and my time as a coach for Nigeria. I smiled as I recounted this long journey and realized that all those experiences prepared me for this place and this time. What a journey it was! Now I was at the very threshold of perhaps the biggest day of my professional life and a feeling of quiet anticipation overcame me as I returned to the moment and the task at hand. All the training and work was now to be put to the test, and I was anxious to see the result. So one chapter closed as I waited for the next chapter to be written.